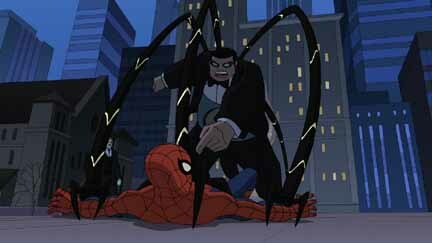 The "Gangland" episode of The Spectacular Spider-Man will premiere on Disney XD on Wednesday. "On Valentine¹s Day, Peter Parker jeopardizes his relationship with girlfriend Liz Allan, when Tombstone, Doctor Octopus and Silverman call a Valentine's Day Summit. But when Hammerhead betrays them all in an attempt to become the new Big Man, the summit erupts into a gang war -- one only Spider-Man can stop!" "Gangland" was written by Andrew Robinson and directed by Jennifer Coyle. For covers and three-page previews of Dark Horse Comics titles arriving in stores on Oct. 21, CLICK HERE. Titles include Beasts of Burden #2, Citizen Rex #4, Star Wars: Knights of the Old Republic #46, Sugar Shock and Zero Killer #6. For previews of Marvel Comics titles arriving in stores on Oct. 21, CLICK HERE. * FX will air Constantine on Saturday, Oct. 31 at 11 a.m.